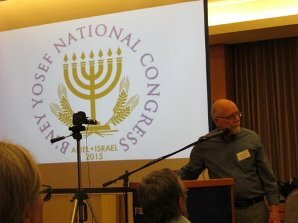 The First B’ney Yosef National Congress was held May 25th – 28th, 2015, at the Eshel HaShomron hotel in Ariel, Israel. There were 135 people in attendance, representing some 12 countries. The prevailing attitude throughout the days of the Congress and the two days beforehand (Shabbat and Shavuot) was one of humility, love, and unity. All attendees seemed to be keenly aware that this was an historic event and that it was the work of the Father. When I heard of the B’ney Yosef Congress, I was quite thrilled to embark on what I had envisioned to be some epic quest, to which I was to be sent as a diplomat from my hometown in the Pacific Northwest in order to represent people here and to argue on their behalf in a court-room style drama that would resemble something one might witness during a heated debate in the US Senate. When I arrived at the hotel in Ariel, I was immediately met with a spirit of love and cooperation, and not with intense debates that I was expecting. I was able to connect with over 130 delegates from thirteen countries around the world, and I believe that each and every man and woman who was present there was called– just as Queen Esther– for such a time as this. I very quickly realized that coming into this movement with a preconceived agenda was not within the Father’s will for any of us; instead, what He had planned was bigger than any one of us, but included all of us…..